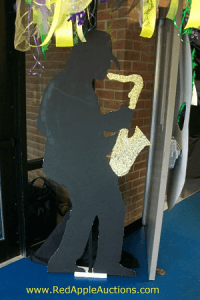 Using your personal Pinterest site — or creating one for the school auction — can be one way to drum up interest in the gala. Pinterest is a social media site based on sharing photos. The tool’s demographic data indicates that Moms LOVE Pinterest. Perhaps because it’s easy to post content onto the site and let a snapshot tell the story. It goes without mention that a lot of moms also plan galas, and many actively seek new school auctions ideas. So why not let these creative women use their Pinterest “hobby” to broadcast the auction? The watermark could be your registration link to buy tickets. I did this through Pixlr.com. 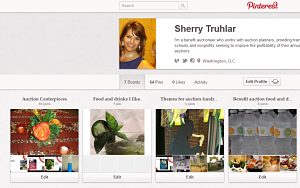 In your Pinterest account, create a Board (a board is Pinterest’s version of a folder) for your auction. Watermark the photos you plan to upload with text. You can use a free service like Pixlr. You’ll want to do this step because if a photo is re-pinned onto another board, the caption might not be pulled over. (And remember, the point is to advertise the auction.) The watermark should point people to something useful, like a weblink to buy tickets to the gala. Use the ideas below to get started. 1. Showcase your volunteers. Snap a photo of volunteers working, like painting the backdrop canvases that will be stationed around the room, or stuffing invitations into envelopes. 2. Highlight a way-cool item. Select one that you know will get guests salivating. 3. Show where the funds raised will be spent. If money raised from your school auction will re-grade the football field, show the existing problems in the field. If it goes towards scholarships, show the students studying in the library. 4. Take me on the journey as you transform your auction venue. If the auction will be held in the school gym, let me see bleachers being moved away to make way for silent auction tables. Let me see the décor committee setting up the props. 5. Share a special moment from last year’s event. Maybe it’s an excited bidder wildly waving her bid card or three friends laughing around the silent auction table. 6. Are you honoring anyone? Is there a key person who needs to be seen in your photos? Put his or her photo on your site! At one of my school auctions, the Pastor was always an integral part of the gala. One year he agreed to cut off his ponytail at the end of the auction, if a certain amount of money had been raised. Posting a photo of him receiving his end-of-gala haircut would draw traffic. 7. Got a theme? Showcase it! Take shots of the centerpieces, the décor, or whatever else conveys the theme. 8. Take a photo of the auction invitation and put it on your Pinterest site. Include a website beneath the photo that tells guests where to go for more information or to buy tickets. You might have already found other ways to use Pinterest to promote your benefit school auction. Feel free to share your ideas below. That’s great, Bonnie! It’s like hitting two birds with one stone (not that I throw stones at birds).